Textiles form a growing share of household waste fueled by fast fashion and dropping production costs. The EU is addressing the issue by the amendments to the Waste Framework Directive that were agreed upon in December 2017. The member states are now required to set up a separate collection for given household waste fractions, including textiles, by the year 2025. Turku University of Applied Sciences carried out a study for Remeo Ltd to scan the composition of post-consumer end-of-life textile in Southwest Finland. The aim of the study was to clarify the composition of the material that consumers bring in to textile collection in terms of fiber content as well as sizes and weights of the textiles. The objective was to better understand what kind of raw material would be available for material recovery, and what kind of machinery would be suitable for moving the textiles on an automatized sorting facility. Another aim of the study was to determine the limits of manual sorting based on only the washing tags in the textiles, thus revealing the share of the material, where the fiber content could not be determined. The study was conducted in two parts, the first part taking place in summer 2017 and the second part in spring 2018, to get an impression of seasonal changes of the material. In both parts of the study, a sample of 1000 kg of material was sorted carefully. 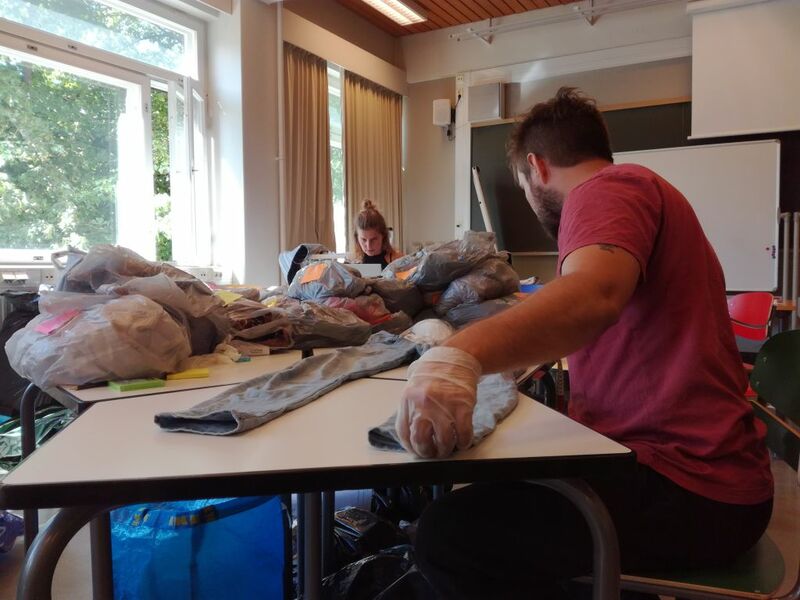 The study was made in cooperation with Lounais-Suomen Jätehuolto Ltd, a municipality owned waste management company in Southwest Finland, who arranges the collection of end-of-life textiles in the area and provided the materials for the study. Materials used in the study were end-of-life textiles consumers had brought to the waste treatment centers and sorting stations. The study material was used untreated; no presorting was done prior to the study. Students sorting the textiles in the first part of the study. The basis for the study were the recycling instructions by Lounais-Suomen Jätehuolto. According to their instructions, end-of-life textile collection receives unusable dry clothes and household textiles packed in plastic bags to prevent spoilage from moisture or contaminants during storage and transport. Unusable rugs, accessories, underwear or socks, pillows, blankets, and padding are sorted as disposable waste instead. In the study, the research material was primarily sorted according to whether it belongs to end-of-life textile collection, or not. Textiles that belonged to the collection were further sorted by fiber content as stated in the washing tags. Unidentified textiles, where the tags were either missing or unreadable were sorted into their own fraction and products made of more than one material layer constituted the last fraction. The sizes and weights of individual pieces of clothing were also recorded. In both parts of the study approximately third of all sorted material was unidentified by the washing tags. The share of material types that could be identified by their washing tags remained similar in both parts of the study. The amount of individual fiber types and blends were found to be relatively high in both parts, with almost 200 different fractions in the first and well over 200 fractions in the second part of the study. Cotton, polyester, and blends were the most common materials found in the study. The amount of material that was not included in the study based on the recycling instructions was 7% in the first part, and 19% in the second part of the study. Share of each material in 1000 kg of end-of-life textile. Click to enlarge. When third of the material is unidentified by washing tags, it means that a significant share of resources may remain untapped. That’s why other forms of fiber content identification are studied as part of the Telaketju project. Supplementing manual sorting with mechanical sorting could make sorting the end-of-life textile more feasible in a larger scale in terms of speed and volumes that could be processed. It could also aid in keeping production costs low, thus keeping the prices of recycled material at a level viable for further use.